DANNY DEVITO voices The Lorax in “Dr. 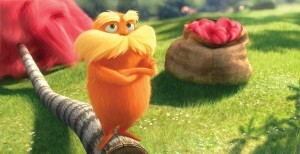 Seuss’ The Lorax.” ©Universal Studios. (Click on photo for hi-res version). This expanded and beautifully computer-animated version of the 1971 Dr. Seuss book manages to make a pro-environment parable irresistibly entertaining. Its cautionary “greed is bad” message is more crazily charming than heavy handed, with some wildly elaborate musical numbers and high-energy chases to help the conservation-minded medicine go down. “Dr. Seuss’ The Lorax” reunites “Despicable Me” director Chris Renaud with writers Cinco Paul and Ken Daurio. Both movies have the same slickly state-of-the-art visual style. Purists may object that the film’s characters and settings are more realistically rendered, smoothly rounded and just plain prettier than Dr. Seuss’ trademark scritchy-scratchy drawings. The same criticism could be leveled at 2008’s “Horton Hears a Who!,” also written by Paul and Daurio. In addition, the screenplay supplements the book’s plot to the point that there is more new story here than old, with several added characters, a lot more action and a new ending. Most alarming of all, the movie includes almost none of the book’s distinctive rhyming narration and dialog. A Dr. Seuss movie bereft of rhyme? It cannot be, it is a crime! What’s impressive is that the project still works surprisingly well, with a breezy charm that lightens the book’s grim mood without subverting its point. Think of this amped-up and more adventure-oriented interpretation as an extended remix of a classic. Besides, a far more faithful rendition already exists: A 1972 TV version retained the scruffy menace of the book’s illustrations, with a teleplay and song lyrics by Dr. Seuss — aka Theodor Geisel — himself. A boy who mostly only listens to that story in the book becomes the movie’s main focus. Lovestruck Ted (likably voiced by Zac Efron) hopes to impress artistically inclined Audrey (pop star Taylor Swift, who strangely never sings a note here) by giving her a real tree for her birthday. His wacky but wise grandmother (Betty White) says only the Once-ler can tell him where the trees went, but that Ted must journey outside their thoroughly artificial town to find him. Riding a cartoonishly cute and agile one-wheeled motorcycle, Ted discovers a grayly barren wasteland on the other side of the town’s high walls. The hermit-like Once-ler (Ed Helms, in high hilarity) tells a flashback tale about his discovery of a fantasyland forest full of singing fish and cuddly bears. When he cut down a pink-tufted tree so he could weave a weird garment called a Thneed, the furry orange Lorax (an endearingly gruff Danny DeVito) appeared from the stump to plead nature’s case…but the Once-ler refused to listen. The best of the clever and catchy musical numbers is an electric-guitar rocker called “How Bad Can I Be.” Helms belts out that showstopper with impressive theatricality, set to a dazzlingly hallucinatory money-money-money montage.